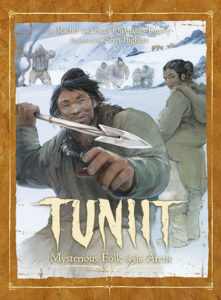 Tuniit: Mysterious Folk of the Arctic is a fascinating book that introduces the reader to the Tuniit—an ancient race of northern people that pre-date the Inuit. Written from both the mythological and the scientific point of view, the book is filled with interesting information about these mysterious folk. Classroom Connections: This book would support any classroom study of Canada’s Arctic regions. By explaining their geographical origins and then comparing the similarities and differences between the Inuit and the Tuniit peoples, the book gives the reader a glimpse of a traditional way of life in the north. Full colour illustrations, labeled drawings of artifacts and the translations of Inuit vocabulary are helpful text features. The little stories imbedded in Tuniit: Mysterious Folk of the Arctic could also be used as a springboard to explore the many legends, stories and myths from Canada’s north.